Wanted to share with you all today a super simple, super cheap, & effective DIY surf spray for those popular beach waves everyone is doing. I recently chopped 8 inches off my hair to sport the new 'lob' 'do, which I absolutely love! It is so easy to style and in my opinion looks the best when styled with these loose beachy waves. I bought Bumble & Bumble's Surf Spray right after my haircut, but for $25 a small bottle, I figured out how to make a very similar spray which will cost you next to nothing, and made from all natural ingredients and no chemicals! Many of the sea salt sprays are also drying to the hair, as salt pulls moisture and natural oils out, but this recipe contains epsom salt (which is less drying), as well as coconut oil, which is sooo good and hydrating for your hair. 1. 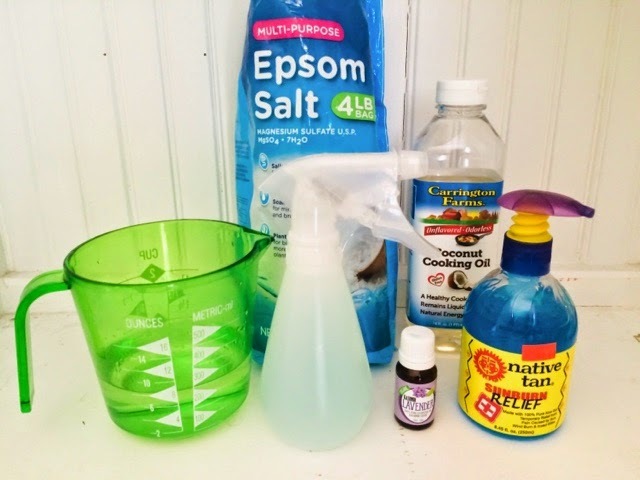 Dissolve Epsom salt and aloe vera gel into hot water. 3. Pour into spray bottle and shake well.